PerfectTablePlan v6 is a paid upgrade for customers with a v5 (or earlier) licence. See our v6 upgrade FAQ for details. Note that the screenshots may not match the exact appearance of your PC, depending on which version of Windows you have, which browser you are using, the version of PerfectTablePlan and how your PC is configured. 1. If you have an older PC, please check that it meets the modest minimum system requirements for running PerfectTablePlan. 2. Right-click on the link and select Save link as... (Chrome), Save Link As... (Firefox), Save target as... (Internet Explorer). Typically it will download to your Downloads or Desktop folder. Depending on how your browser is configured, you might be asked to choose a location for the download file. 3. When the file has finished downloading on to your PC, double click on the downloaded .exe file to install the software. 4. A security window may appear. Click the Yes button (it may be a Run button on some versions of Windows). The exact warning message may vary. 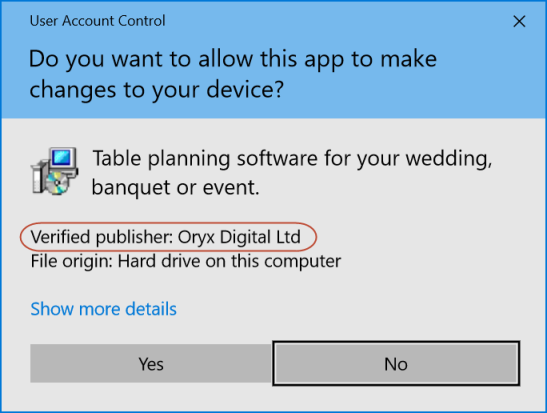 However the file is safe to run as long as the software is digitally signed by us (publisher is shown as "Oryx Digital Ltd"). 5. The installer should now start. Follow the PerfectTablePlan installer instructions. If you want more help read our step-by-step instructions for downloading, installing and starting. 6. By default, PerfectTablePlan will start automatically after installation. Otherwise you can start PerfectTablePlan from the Windows Start menu or the shortcut optionally installed on your Windows desktop. If you have any problems please consult the Windows installation troubleshooting page or try the zip version. Note You can uninstall PerfectTablePlan at any time with a few mouse clicks. PerfectTablePlan is also available for Mac.